FACT CHECK: 'Doonesbury' Predicted Trump's 2016 Presidential Run? ‘Doonesbury’ Predicted Trump’s 2016 Presidential Run? 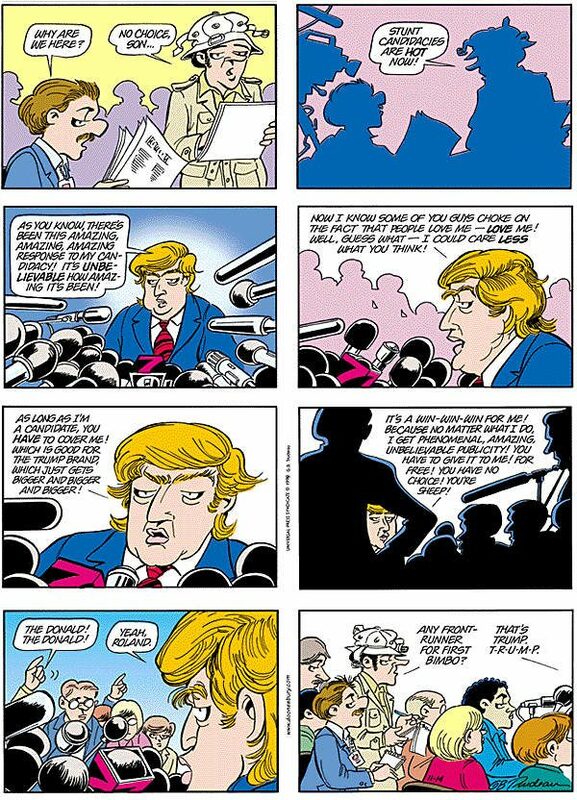 A 'Doonesbury' comic strip from 1999 didn't 'predict' Trump's 2016 presidential run; it mocked his possible 2000 campaign. 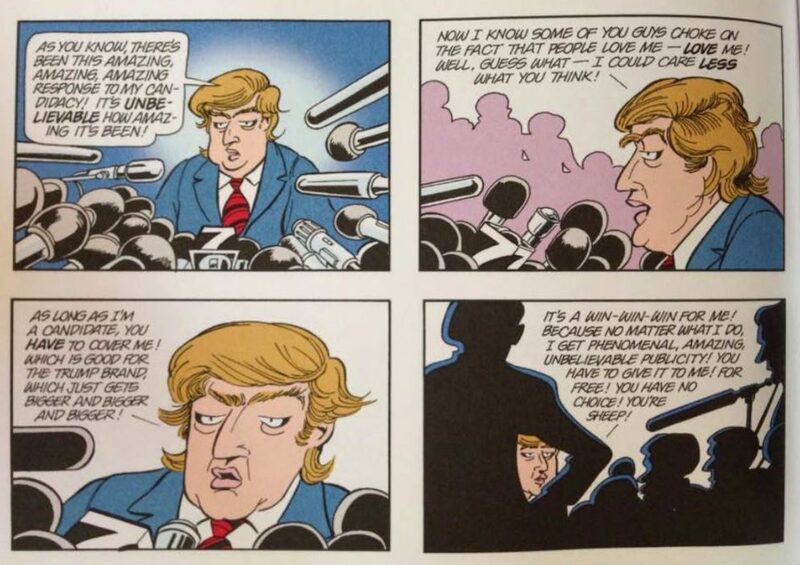 A Doonesbury comic from 1999 predicted Donald Trump's presidential run in 2016. A 'Doonesbury' comic strip from 1999 featured Donald Trump talking about his presidential candidacy. The comic strip was published shortly after Trump announced the formation of a presidential exploratory committee for the 2000 election; it didn't 'predict' his 2016 presidential run. The strip is real and does date from 1999, but it didn’t really predict Trump’s 2016 candidacy. Garry Trudeau has lampooned Trump in his comic strip many times over the last three decades — so much so that in June 2016 he published a Yuge! 30 Years of Doonesbury on Trump, a book comprising nothing but Doonesbury strips featuring the Donald Trump character. The 1999 wasn’t remarkably predictive for positing Trump as a political candidate back in 1999, however, because the business magnate has been flirting with politics since the 1980s. In October 1999 Trump announced that he was forming a presidential exploratory committee for the 2000 election, and the strip displayed above was published a few weeks after that announcement, on 14 November 1999. The long career of the series and continual use of real-life political figures, analysts note, have led to some uncanny cases of the cartoon foreshadowing a national shift in the politicians’ political fortunes. Tina Gianoulis in St. James Encyclopedia of Popular Culture observes that “In 1971, well before the conservative Reagan years, a forward-looking BD called Ronald Reagan his ‘hero.’ In 1984, almost ten years before Congressman Newt Gingrich became Speaker of the House, another character worried that he would ‘wake up someday in a country run by Newt Gingrich. '” In its 2003 series “John Kerry: A Candidate in the Making” on the 2004 presidential race, the Boston Globe reprinted and discussed 1971 Doonesbury cartoons of the young Kerry’s Vietnam War protest speeches.